Booklet, "DECLARATION OF THE IMMEDIATE CAUSE WHICH INDUCE AND JUSTIFY THE SECESSION OF SOUTH CAROLINA FROM THE FEDERAL UNION AND THE ORDINANCE OF SECESSION", 13pp. 5-1/4"x8", Charleston, 1860, "PRINTED BY ORDER OF THE CONVENTION", and printed by Evans & Cogswell. Original paper cover. 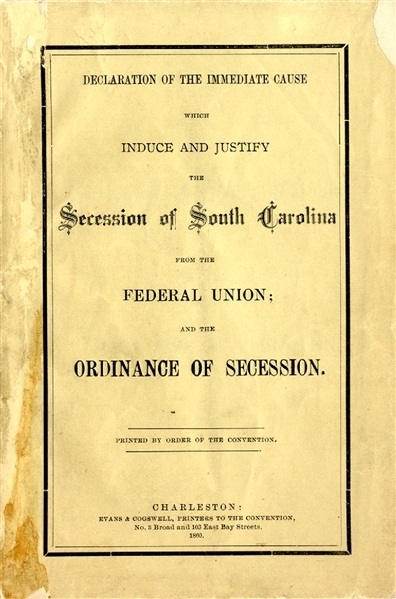 This secession publication details the "immediate causes" which led South Carolina to secede as well as including "AN ORDINANCE TO DISSOLVE THE UNION BETWEEN THE STATE OF SOUTH CAROLINA AND OTHER STATES UNITED WITH HER UNDER THE COMPACT ENTITLED 'THE CONSTITUTION OF THE UNITED STATES OF AMERICA.' We, the People of the State of South Carolina in Convention assembled, do declare and ordain, and it is hereby declared and ordained, That the Ordinance adopted by us in Convention, on the twenty-third day of May, in the year of our Lord one thousand and seven hundred and eighty-eight, whereby the Constitution of the United States of America was ratified, and also, all Acts and parts of Acts of the General Assembly of this State, ratifying amendments of the said Constitution, are hereby repealed; and that the union now subsisting between South Carolina and other States, under the name of 'The United States of America,' is hereby dissolved..." And is signed in type by over 150 members of the convention. This issue is a reprint produced after the Civil War, and a wonderful memento of that great conflict. Last one we sold in 2008 for $675.